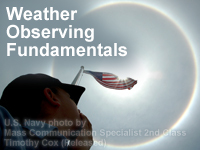 "Weather Observing Fundamentals" provides guidance for U.S. Navy Aerographer's Mates, Quartermasters, and civilian observers tasked with taking and reporting routine, special, and synoptic observations. Although the focus of this lesson is on shipboard observations, much of the content applies to land-based observing and reporting as well. The lesson details standard procedures for taking accurate weather observations and for encoding those observations on COMNAVMETOCCOM Report 3141/3. Exercises throughout the lesson and four weather identification drills at the end provide learners with opportunities to practice and build their skills. The lesson covers a large amount of content. You may wish to work through the material in multiple sessions. It was a very informative learning experience. I found it very helpful. Very good explanations for the topics presented. Some of the animations and video explanations were a bit unclear. Altogether a decent introduction. This was an interesting and challenging course, but well worth the time to take if you want to learn more about weather observations. This is good for a observer near a ocean,or on a ship, but not in normal observing condions. Great training other than the last few questions about cloud OCTAS. Definitely not the correct answer. Would be 5 stars but I'm bitter because I know nothing about ice. Also the thing they used to show the total cloud cover was kind of bogus it was totally 7/8!! !